If you would like to be added to the EVAC Update list Please Click Here! EVAC-East Village Art Coalition: A coalition of urban artists dedicated to building an alliance between the visual arts and the community. Through outreach programs and exhibitions we provide support to the professional development of emerging visual artists in the greater Des Moines area and contribute to the cultural and economic development of our community. Des Moines Public School System. Announcing the "High School Edition"
The goal of this project is to raise funding for Visual Arts in Education in the Des Moines Public School System. In 2005 the East Village Art Coalition invited 54 artists from Central Iowa and other cities across the nation to volunteer their efforts by each interpreting one card out of the standard playing deck on canvases provided by the Art Store in Des Moines, Iowa. The Jokers were each interpreted by two sculptors from the Des Moines Metro area. Many thanks to the Polk County Heritage Gallery for hosting our exhibition entitled "52 Pick-Up". These unique playing cards are a result of combined efforts of numerous sponsors and volunteers who have graciously donated their time and resources to this project. The HIGH SCHOOL EDITION is underway! Five high schools from the Des Moines Public School System have come together in collaboration to take ownership of their own "52 Pick-Up" exhibition. Art students from East High School , North High School , Future Pathways, Lincoln High School and Hoover High School are now in the process of creating works of art based on their interpretations of playing cards. Stay tuned for more announcements and exhibition information. Decks from the 2005 "First Edition" are still available for $20.00 each. Look for the new 2006 "High School Edition" coming soon for the Holidays! All proceeds from sales beyond administrative and production costs will be donated to the ART programming needs of the participating schools. Decks from the "First Edition" are still available at these locations. Des Moines Botanical Center, 909 Robert D. Ray Drive, Des Moines, 515-323-6294. State Historical Society, 600 East Locust St., Des Moines, 515-281-5111. Zanzibar 's Coffee Adventure, 2723 Ingersol Ave. , Des Moines , 515-244-7694. Ritual Café, 1301 Locust St. , Des Moines , 515-288-4872. From Our Hands, 400 East Locust St . , Des Moines , 515-282-3496. Tandem Brick, Gallery and Frame, 2722 Ingersol Ave. , Des Moines , 515-282-1031. Zzz Records, 424 E Locust St., Des Moines, 515-284-1401. 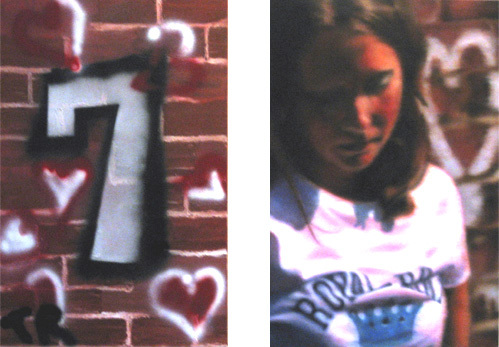 7 of Hearts (left) By Theresa Ryan and Q of Hearts (right) by Larassa Kabel. Images of Artwork were Photographed by Mike Schappaugh.